Customers with Office 365 E plans, SharePoint Online + Yammer, or existing Enterprise Agreements and qualifying license purchases are eligible to activate Yammer Enterprise via their Office 365 Administrators portal. 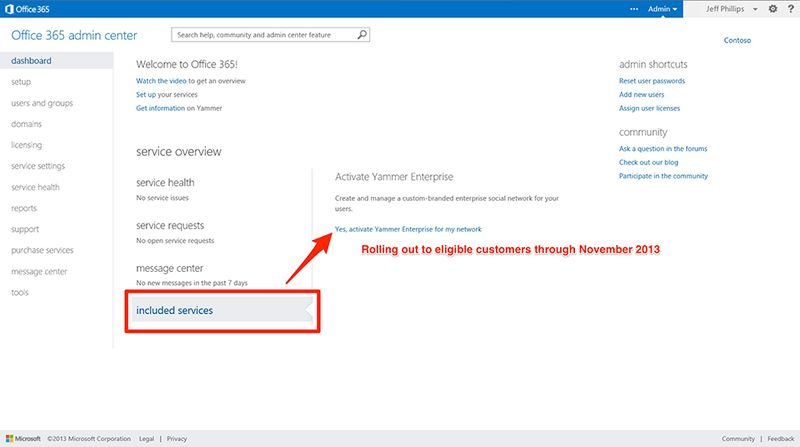 To see if Yammer Enterprise is available for your account, check the Included Services link in your Office 365 Administration portal. This is a rolling release starting November 1st, and all eligible customers should see this link by end of November 2013. For Enterprise Agreement customers who would like to start the activation process now, fill out the form and a Yammer Sales Representative will contact you. Hi Darrell,Thanks for your post! One question. What is the impact on a production free Yammer subsription when activating Yammer Enterprise?